You love your animals and need to give them a safe environment and shelter to live in! We can make it happen and at the most affordable cost in the industry. Horse barns, goat barns, llama barns, loafing sheds, arenas, hay covers, and all types of Ag buildings, including pole and all steel construction. We build them all and are very cost effective. Contact us by e-mail or on our toll free number today for a free quote on any building you need. Our friendly & knowledgeable staff will serve your needs with a quick building quote turn around. We specialize in Equestrian Horse Barns. 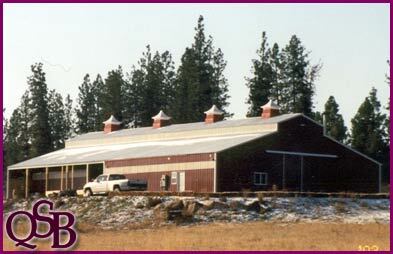 Our knowledgeable staff has served the Northwest Agricultural and Equestrian industry for years. We can provide you with custom stalls for horses, llamas, sheep or goats. Specialized areas for your equestrian equipment and even lofts for storing your hay. We also build an array of hay covers and post-frame hay storage for those with larger hay storage needs. If your looking for Agricultural & Equipment Storage Quality Steel Buildings, Inc. is the right place. We will custom design a pole barn to fit your equipment and growth plan. We know an Ag farmers equipment investment is what keeps things rolling on the farm and that's why we work hard to design a building that fits both your needs and your budget.